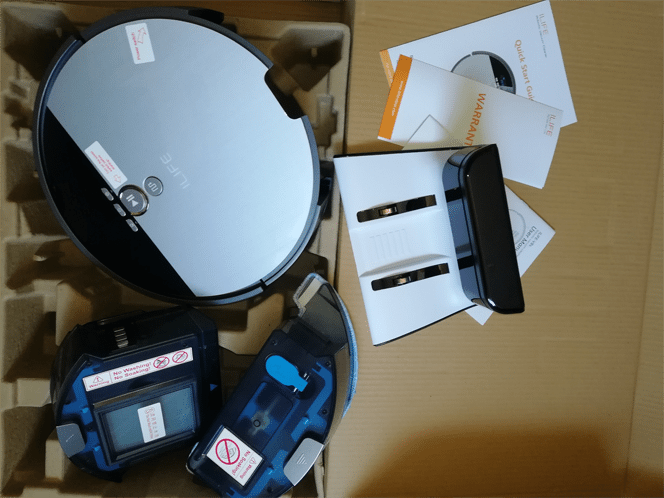 It has been a while since we reviewed a robotic vacuum. 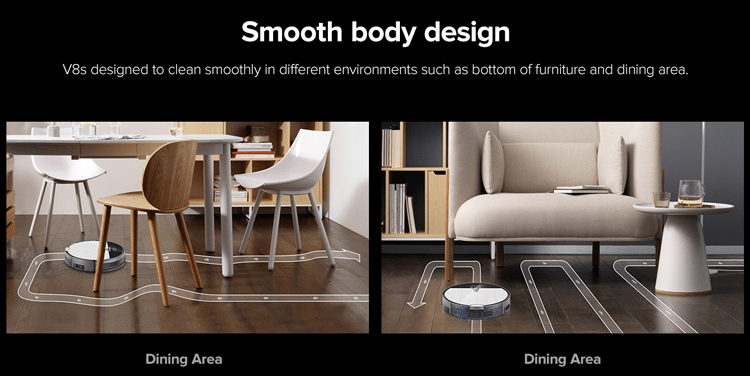 In the past, we gave Xiaomi Mi Robot Vacuum a look. Meanwhile, we also presented the affordable ILIFE V7. Today it's time to test the new and advanced model of ILIFE, the ILIFE V8s. 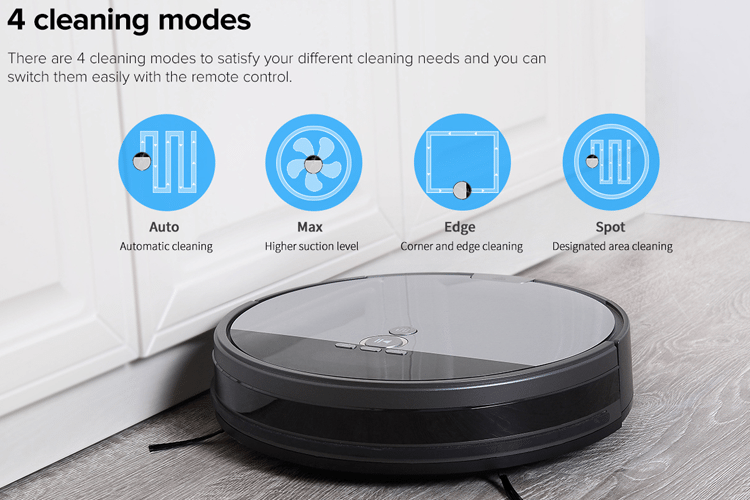 This is also an affordable robotic vacuum, but is it any better than its predecessor, and how much will the upgrade cost? How much does the ILIFE V8s costs? The ILIFE INNOVATION LTD. came with a new flagship model, the ILIFE V8s. As we will see, however, there is a massive update on the outside and a small price difference. The ILIFE V8s can not only sweep the floor, but it can also mop it. It has four different cleaning functions that will cover all of our needs. 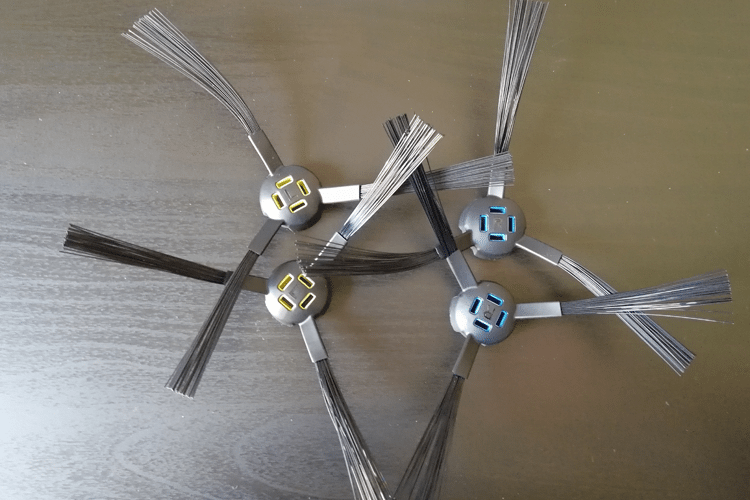 Its sensors are significantly improved, compared to the previous model, so not only won't it fall from the stairs, but it will also track walls and obstacles without bumping into them. Thanks to the off-road wheels, it can go over low-height items, and it won't have any problem on slopes. The new model has a 0.75L dustbin so we won't have to empty it as regularly, and the water tank capacity is at 0.3L. Also, we can schedule the vacuum to clean in different hours, any day of the week we want. 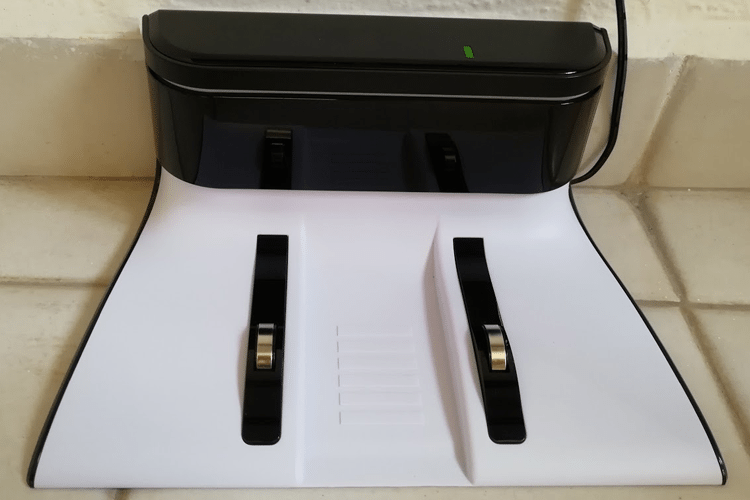 The noise the device produces depends on the cleaning mode it is on, and the 2600mAh battery allows for continuous operation for extended periods of time. 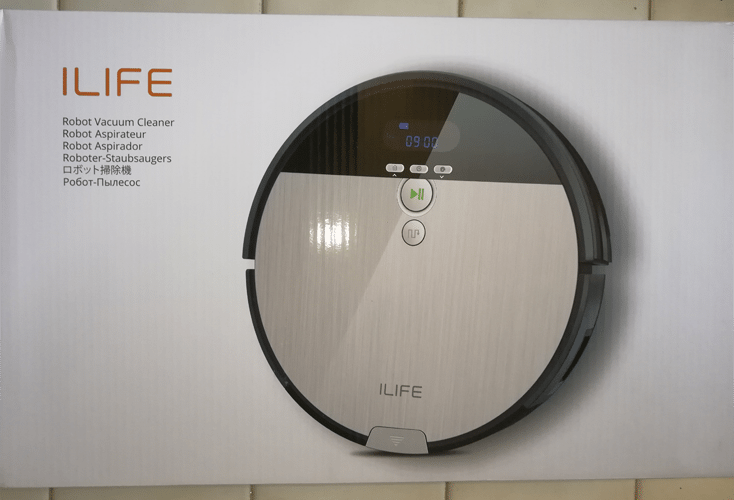 Before we start the unboxing, we should mention that we can operate ILIFE V8s via the buttons on the device, and/or the controller that came with the vacuum. The vacuum's box is clean and simple. 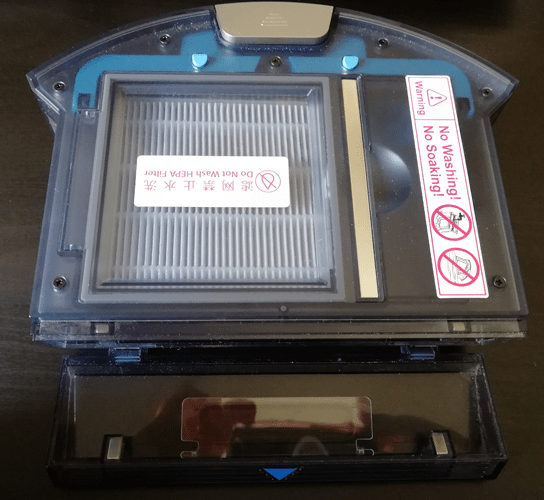 On the sides, we can see the dimensions, and on the back side, we can see what the vacuum can do and the content of the box in various languages. By opening the box, the manual was the first thing we saw. To our surprise, it was very detailed and written in fluent English. With it, we found the warranty and a quick start guide. Furthermore, we saw the charging dock, the water tank, and obviously the ILIFE V8s with the dustbin on it. Finally, the box on the right has a few vacuum accessories and a pair of spare parts. On that box, we found the corner brushes, which snap on the vacuum, and they use a color code for proper placement. 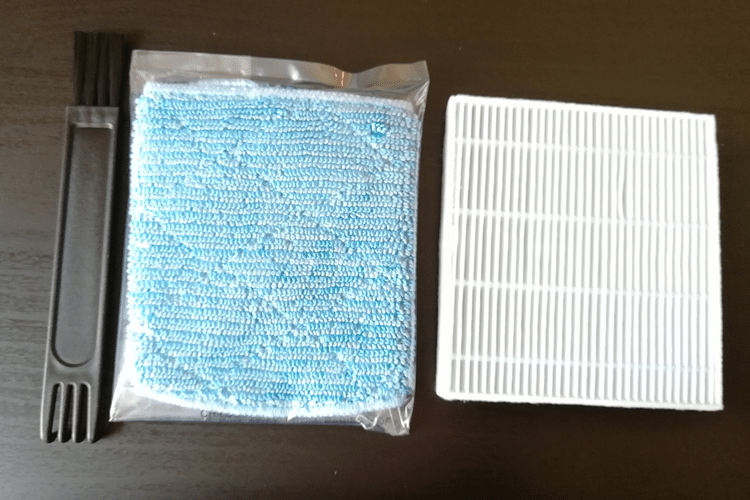 Also, a cleaning brush, an extra mopping cloth, and an additional filter. Of course, the box also contained the controller and the charger for the dock. It was pretty clear that ILIFE V8s is better than the previous model. 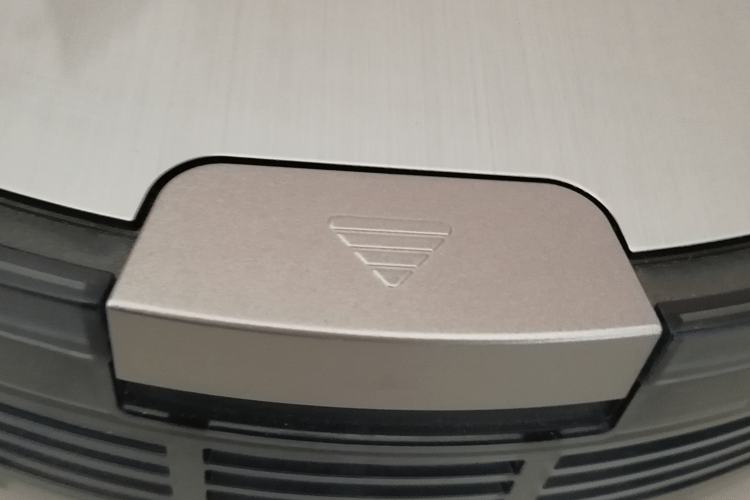 But when we opened the box, we realized that the black/silver color gives the vacuum a premium feel. 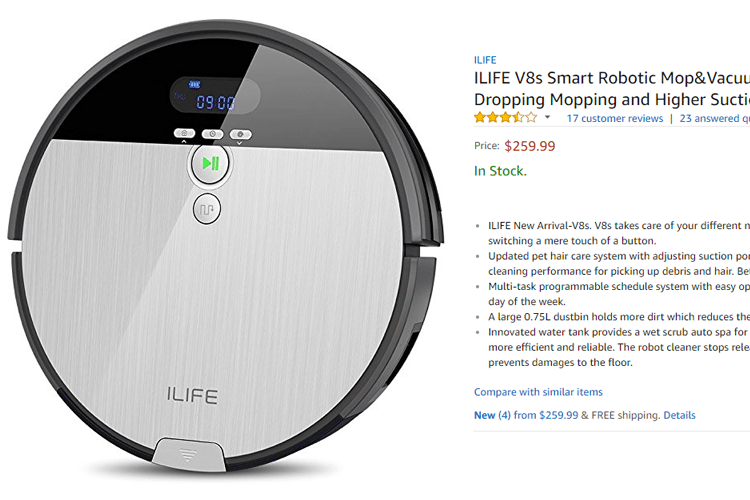 ILIFE V8s is sturdy, and it has a notable weight. On the facade, it has a full set of sensors ready to bypass every obstacle. The dock is extremely modern, thanks to the black and white color and the curved edges. The bins are easy to remove thanks to the button on the edge of the vacuum. The dust bin is easy to clean, and thanks to the magnetic clutch, we don't have to worry whether we closed it properly or not. No need to fear that our vacuum might pick up the trash from one side, only to spit it back out on the floor from the other. However, the bin will always have dust residue, since we can't clean it under running water. The company warns us that the bins have electronic parts and that is why we need to dry clean them. The LED screen is precisely what we need, and we will find it on the top of ILIFE V8s. We can see all the information we need there. The controller is somewhat elegant. It is no longer reminiscent of an A / C one, and it now also has the ILIFE logo on it. To our surprise, the controller didn't have an LCD screen, but as we will see later on, we can program our vacuum from the actual device. Our first impressions were positive. 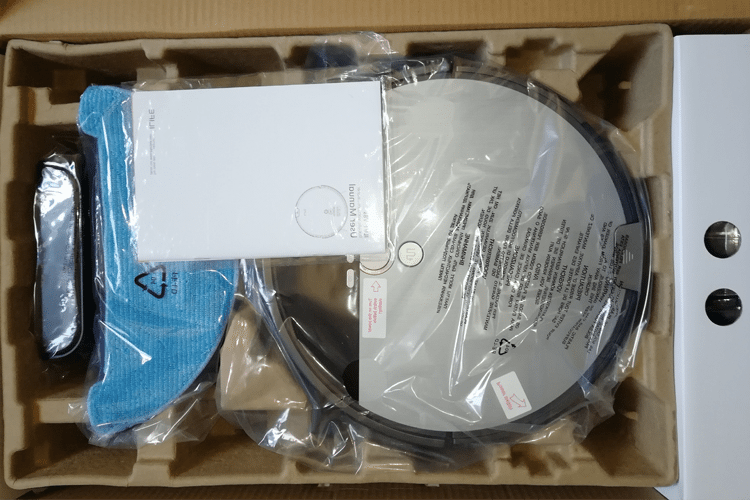 Everything from the packaging to the manual proved that the company did a great job and improved the product significantly. We can control the ILIFE V8s either by the remote controller or from the buttons on it. 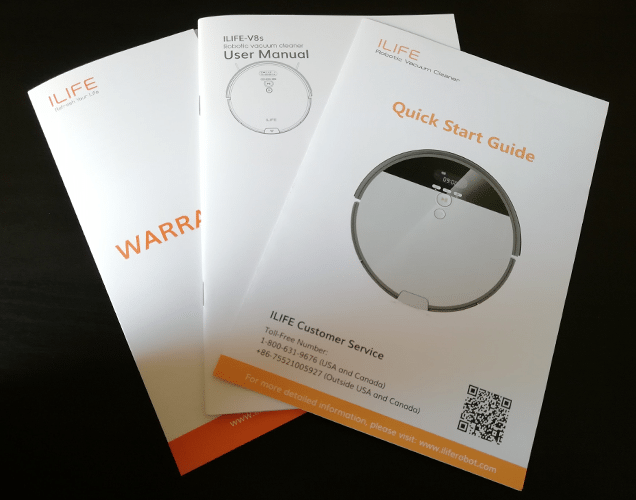 ILIFE has developed an app which was compatible with the previous models. However, we won't find it in this one, and now we can program our device only from the buttons on top of it. Not only was the app not translated into English, but it also had syncing issues, which made it impossible to use. 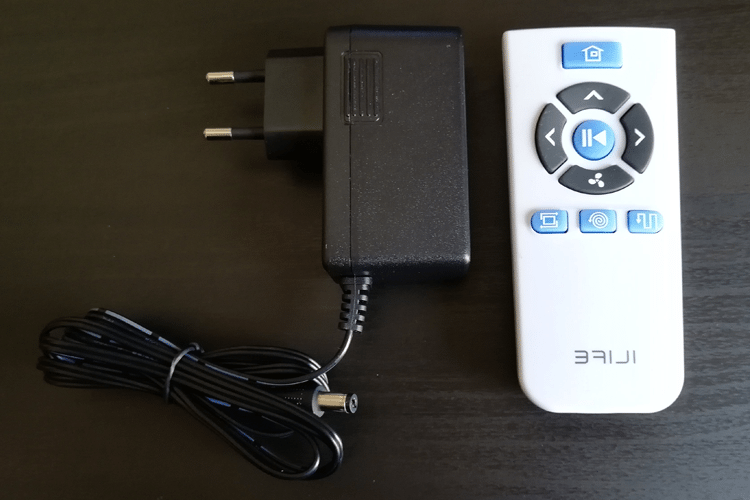 We won't run into any problems when it comes to controlling our device through the remote since everything is very simple. With the top button, we can return our vacuum to the dock. The first three buttons on the bottom part of the remote enable different cleaning modes. More specifically, the first one is the "Path mode," and our vacuum follows a designated path. 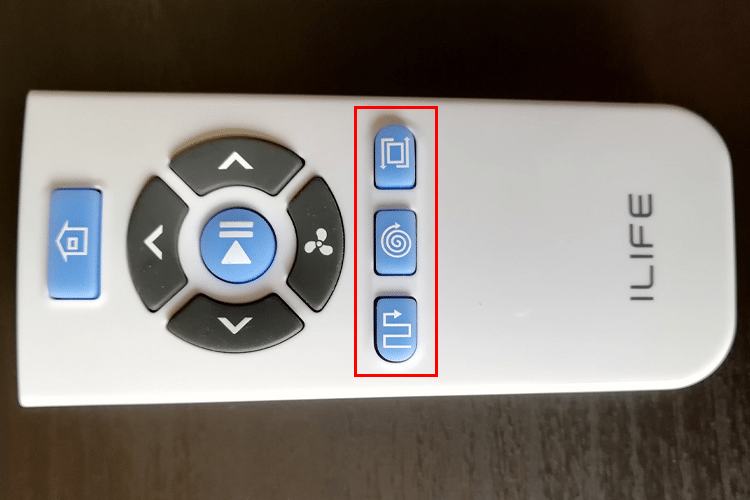 From the middle button, we enable spot cleaning, and the last is for cleaning the corners of the house. The buttons on the center are for basic operation of the ILIFE V8s. With the main one, we stop or start the vacuum, and we can control it with the arrows when it's not cleaning. 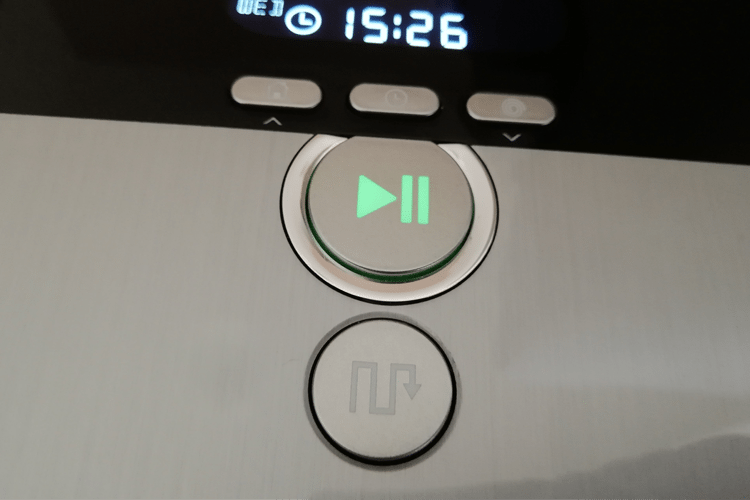 Finally, we have the fan button with which we can change the power of the vacuum from low to high. If we have the water tank on, then we adjust how much water it sprays from three different levels. 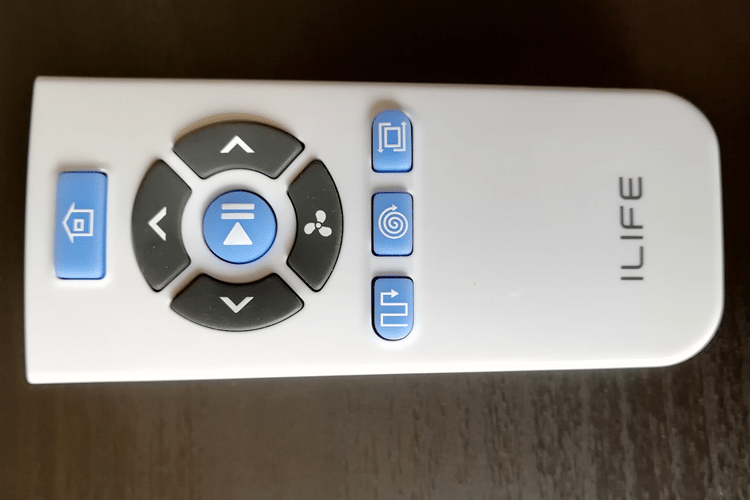 ILIFE V8s has a series of buttons on top of it. With the three top buttons, we can send the vacuum back to the dock, set the time, and schedule the cleaning. Meanwhile, with the third button, it does spot cleaning. As with the controller, the main one starts and stops the vacuum, and the last one sets it to path mode. 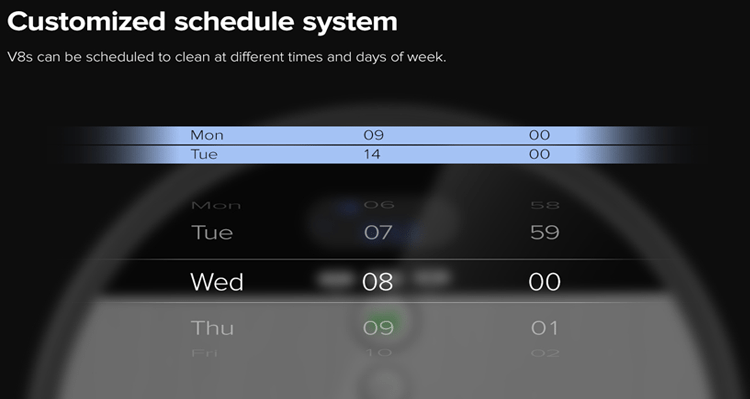 The buttons allow us to set local time and schedule cleaning hours. 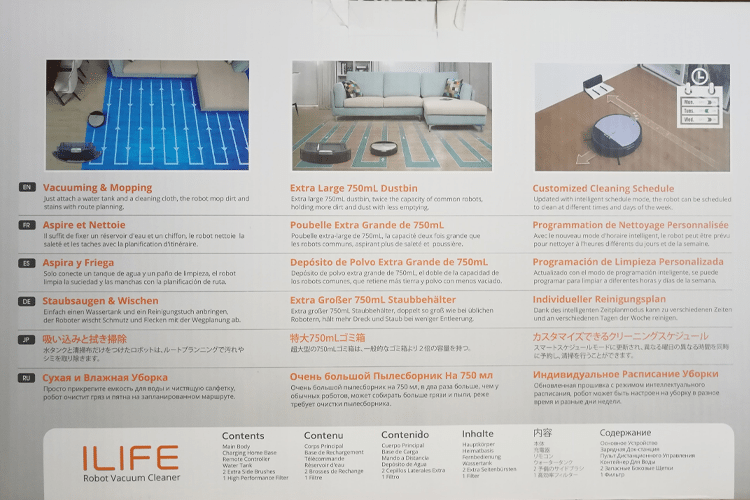 We won't show the scheduling of ILIFE V8s since the instruction manual is detailed and in fluent English. According to the instructions, before the first use, we had to charge the vacuum for 12 hours. When it finished charging, we took ILIFE V8s for a ride. 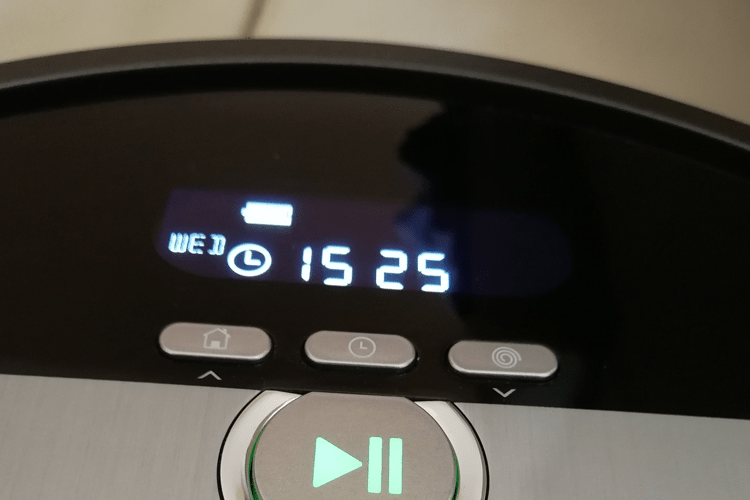 The first press of the Play/Pause button activated the vacuum, and the second started the cleaning. We have to say that ILIFE V8s did a great job. It separated the room into small sections, and it made sure to clean every tile. It didn't face any problems with the obstacles that it came across. 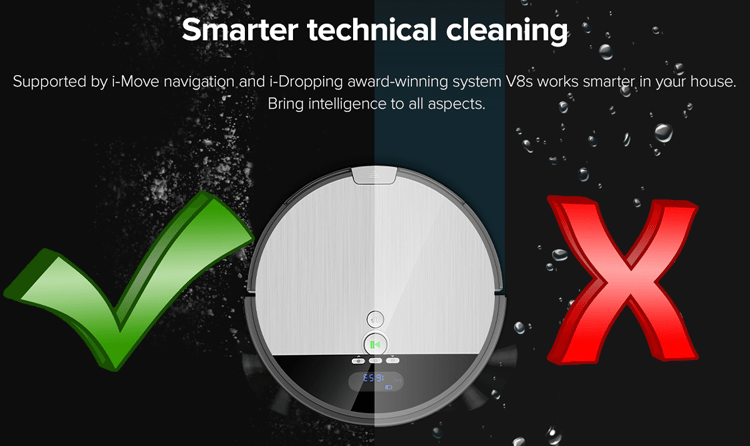 If ILIFE V8s "senses" that there are various obstacles in a section, it stops the path cleaning and cleans in a random pattern. Furthermore, on the LCD screen, we can see the current cleaning mode and cleaning power. For every robot vacuum, the ultimate test is the rugs and carpets. Since we had previous experience with the ILIFE V7, which didn't do so well in that test, we wanted to see what V8s could do. The results were in, and this model passed with flying colors. Thanks to the new off-road wheels it didn't face any problem. Not only did it "climb" the fluffy rug on the living room but it also cleaned it perfectly. Another test in our house were the cable organizing boxes we have on our floors. The previous model would get stuck sometimes and would be unable to go over them. ILIFE V8s proved to be a small monster truck and went over them with no problem. It needed about half an hour to clean the entire house. Even though it finished in a different room from where the dock is, it tracked it quickly and "parked" instantly. 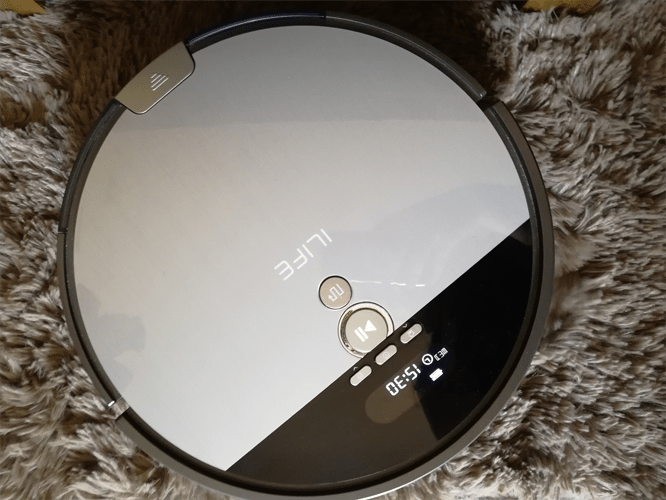 When we finished vacuuming it was the perfect time to test how ILIFE V8s mops. So we changed the bins, we filled the water tank, and we commenced our test. The directions say to fill the tank with water, but it doesn't forbid us from using a floor cleaner. The vacuum was ready, and it started mopping following the default cleaning mode. It separated the room in 23x23 ft. sections. When it finishes mopping a section, it returns to the starting point. Then we need to press start again to clean the next section. ILIFE V8s doesn't recognize rugs as objects. So when it mops, it will not try to avoid them. That's why it would be better to either remove any mats or start the vacuum against the rug/carpet area. 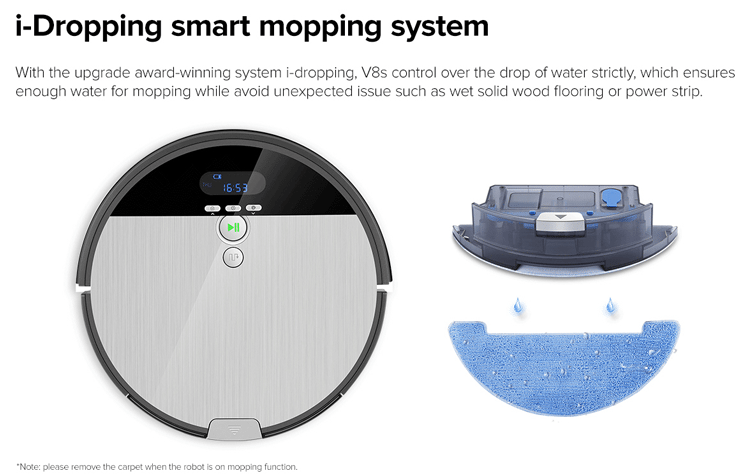 While on mopping mode, we can set how much water ILIFE V8s drops. This is the award-winning i-Dropping system the company has developed. In their own words, the i-Dropping system ensures that it drops water only when needed, and not with the help of gravity as previous models did. The water drips and then gets swiped by the mopping cloth, so the floor doesn't flood with water and it dries faster. We could only come up with one negative comment. In the case of a large house, we will need to refill the water tank a few times. Not to mention that we need to supervise it while it mops since we have to press start again and again. 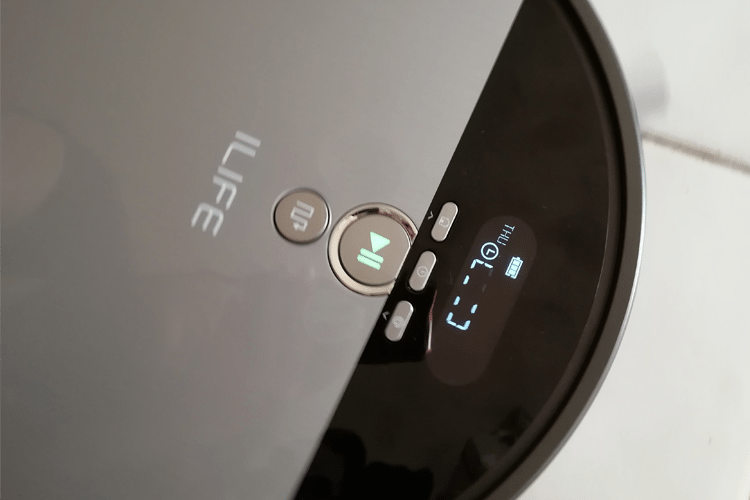 According to the company, ILIFE's battery lasts for approximately one and a half hour. Our tests showed that in high power, the battery lasts a little less than an hour. During normal operation, it lasts approximately one and a half hour. This time is more than enough to clean any average-sized house. Besides, if we live in a 3.000 square feet house, one robotic vacuum won't be enough for us. When the battery runs low, then the vacuum will automatically return to the dock. When the vacuum searches for the dock, it slows down, then lines up with it, and when it's correctly docked, it will make a characteristic sound. We tested the vacuum's ability to dock numerous times, and it did great. Only one out of 15 times it didn't dock properly. When that happened, it backed up a few inches and started the docking process again. We can find the latest ILIFE model from Amazon, and the price is $259.99. 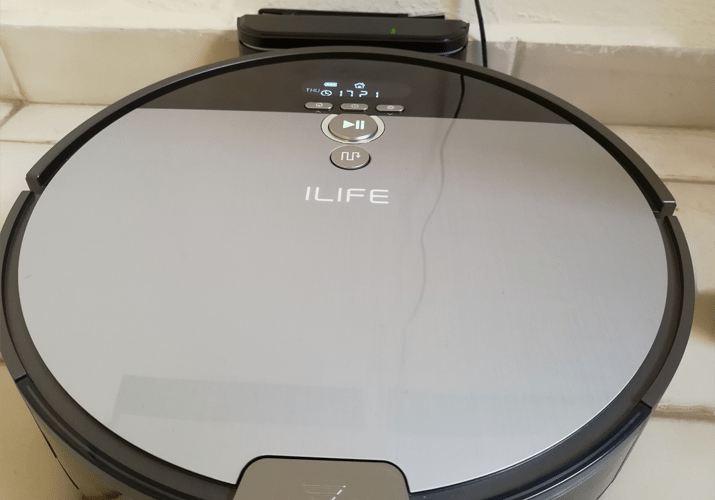 After using the ILIFE V8s for a week, we can say for sure that we are more than satisfied with it. 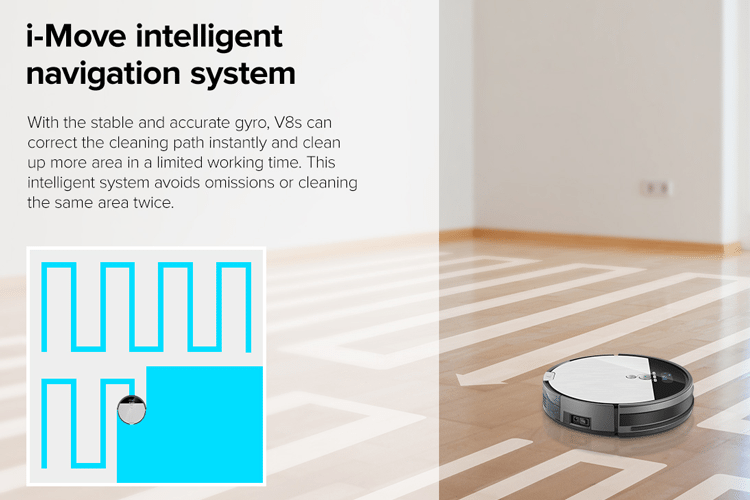 It is the most affordable vacuum with these features we have ever seen. Meanwhile, even if we already have the ILIFE V7, the upgrade is more than worth it. The i-Dropping system is a smart function, which ensures that we will have a floor and not a lake in our house. 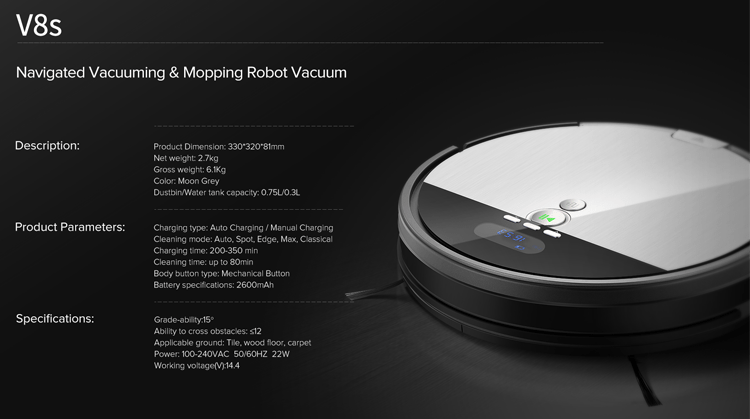 Meanwhile, i-Move ILIFE has the best navigation system on an affordable vacuum we have ever seen. It proved that it doesn't take mapping mechanisms for a vacuum to clean the place thoroughly. 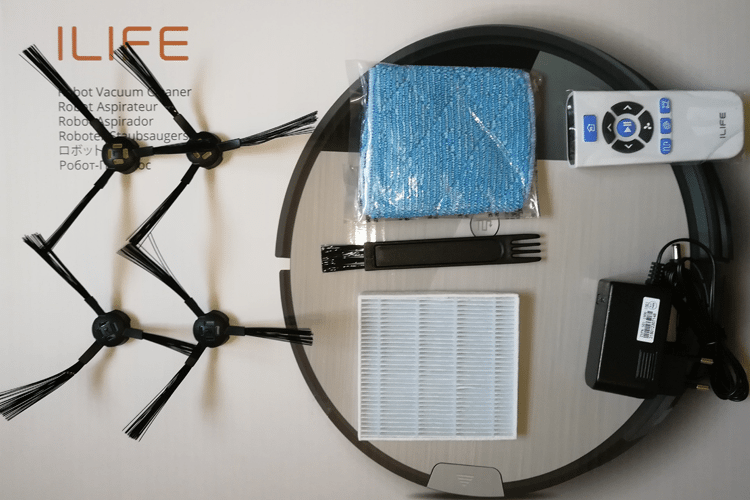 The spare parts ILIFE offers with its products were great additions as well. On top of that, the ability to clean any type of surface, whether that is wood, marble or tile were beyond useful. 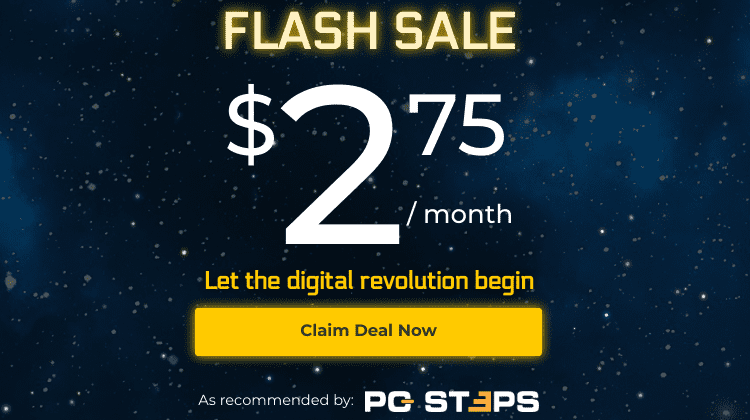 Let's summarize the pros and cons of ILIFE V8s. 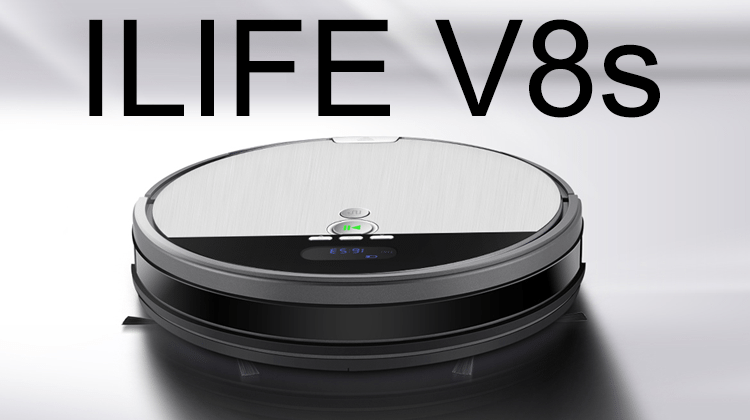 With a competitive price and functions other vacuums don't even have, ILIFE V8s blew out the competition. 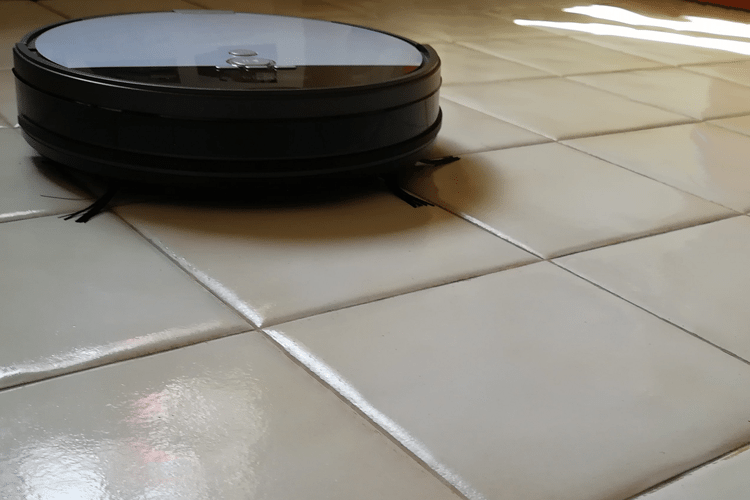 Do you have a robotic vacuum? Or do you plan on buying ILIFE V8s? Maybe you already own one? Share your thoughts on this useful product with us in the comments below.